A church has been told it needs planning permission to put up a wooden cross because it constitutes an advert. Dudley Wood Methodist Church wanted to place a free-standing cross outside as it had just moved to new premises. Dudley Council said that national planning laws classify crosses as adverts and the church must pay £75 for planning permission. Minister Paul Nzacahayo said: "I think this rule is utterly ridiculous. I am very upset such regulations exist." 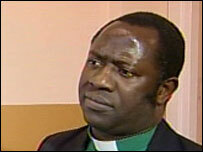 The superintendent of the Overend Methodist Mission told BBC Radio 4's Today programme that he could see no confusion. "I think they have got the wrong end of the stick really because the cross has always been the oldest and identifiable symbol of the Christian faith," he said. "So I don't see how they can confuse it with adverts". The original church in Dudley Wood has just been demolished to make way for new housing, with services now taking place in its old Sunday school building. But Mr Nzacahayo claimed few people realised the Sunday school building was now being used as a church. Dudley Council spokesman Phil Parker said the council was not being heavy-handed. "All such crosses are defined as advertisements in the Town and Country Planning Act 1990. "It is national legislation which is laid down in law and not a judgment made by Dudley Council," he said. "Local authorities do not set the £75 advertisement cost as it is set by the Office of the Deputy Prime Minister."